My husband and I have been together for over 4 years. We built our relationship on being active. Whether it was cycling, running or taking a hike, we spent countless hours outdoors together. When John suffered a spinal cord injury from a mountain biking accident in 2011 we didn’t want quadriplegia to change that. I found Adaptive Star’s website while searching for racer chairs and couldn’t be more pleased with the experience that followed. Within hours of inquiring online, we received a phone call and learned about the many different options and features available to us. The staff was extremely knowledgeable, accommodating and more than willing to take time going over all available options. We were confident we would receive the best chair to suit our needs AND wants and even ended up with some pretty rad custom wheel covers to suit our personality. 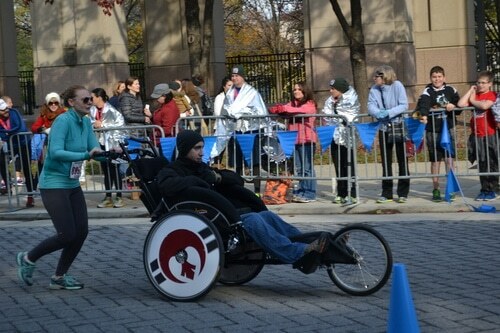 John and I received our racer chair October 2013 and ran our first mini marathon with it November 2, 2013. We ran the same race in 2012 using a borrowed chair but because this racer chair was custom fit to John’s measurements he was much more comfortable for the duration of the race.We can confidently say there will be many more races to come! We seriously could not be happier with our experience from beginning to end. Thank you so very much for everything and most of all for helping us continue being active together!